Phoenix Park Hotel houses 149 spaciously appointed guestrooms and suites: 83 in the original building and 66 in a new wing. 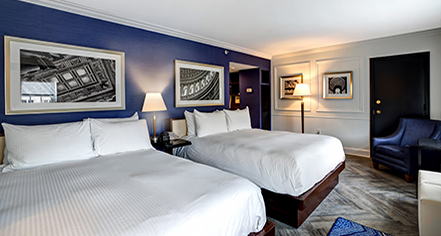 Guestrooms feature queen-size or king-size platform beds with Simmons Beautyrest pillow top bedding, and a marble bath, most with walk in shower. Styled in a crisp, contemporary design with wood pattern floors and custom area rugs, amenities include 43" HDTV, in-room safe, refrigerator, a small movable work table, and a comfortable lounge chair. 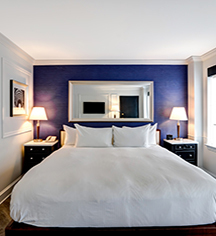 Three penthouse suites and three bi-level suites are elegantly appointed with custom furnishings and luxurious baths; select suites include a separate dining room, study, gas fireplace, or terrace.